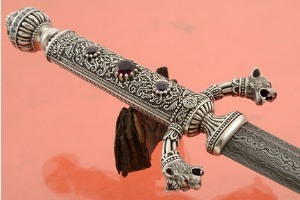 Description: Garri Dadyan, born in Baku, Azerbaijan, was named a National Master Artist of the Soviet Union in 1985 for his unparalleled mastery of repousse metal work. In 1993 he became a member of the UNESCO International Federation of Artists in recognition of his superior artistry. 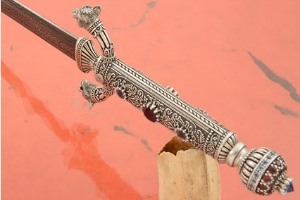 A master metal worker, Mr. Dadyan employs the techniques of chasing, repousse, filigree and granulation, wax casting, engraving and niello with equal virtuosity. Working in solid sterling silver with precious stones, Garri brings old world mastery to the new world that few can emulate. 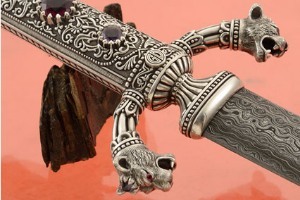 Lion's Crown Jewels is a gorgeous example of the fine craftsmanship of this maker. 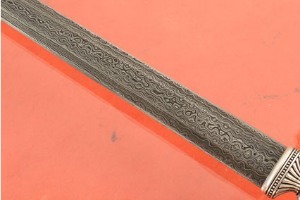 The dagger ground blade is forged from carbon steels. 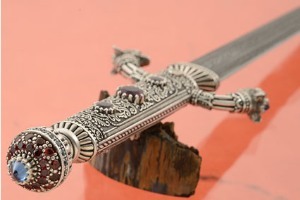 Painstakingly sculpted from solid sterling silver, the handle features an abundance of amazingly detailed carving and engraving. Vines, tiny flowers, and scrollwork abound on the handle, guard, and pommel. 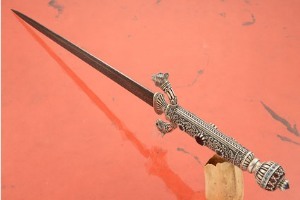 Garri used 225 grams of silver to create the handle. 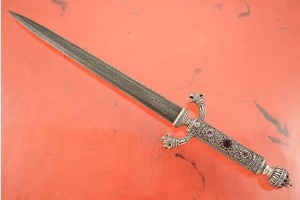 Each of the quillions is completed with highly detailed lion's heads. 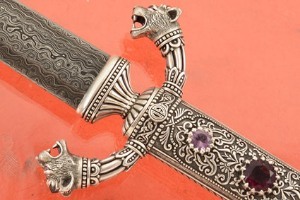 The eyes of the lions are inlaid with faceted garnets and wears a topaz crown. 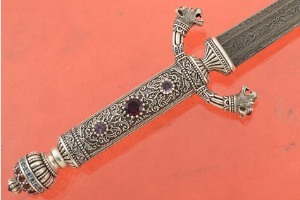 On each side of the detailed handle, it is set with an 11.8mm faceted garnet surrounded by two faceted amethyst. 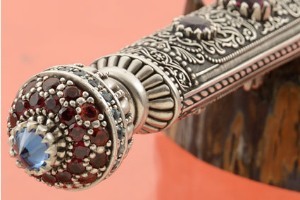 The pommel is set with 15 faceted topaz, 24 faceted garnets, and a central 9mm faceted topaz. All jewels used are natural gemstones and are meticulously faceted. Exceptional fit and finish throughout! This piece truly deserves to be seen to be appreciated. 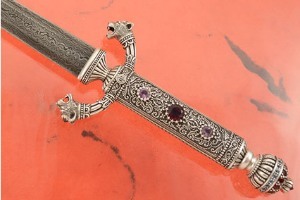 Showing tremendous skill, Garri has made this dagger disassemblable. 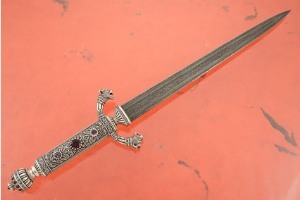 This allows it to be taken apart for thorough cleaning and repair.